Jaguar has been reluctant to enter SUV market for years. First of all, Land Rover offers nothing but SUVs, and they are both parts of the same company. Nevertheless, last year first brand’s crossover hit the streets as F-Pace, and it is already best-selling Jaguar model in the whole history. That is a sign that British are on the good path, and some incredibly revolutionary things are yet on the way. We already saw I-Pace concept last year during LA Auto Show, but Jaguar wants to remind us of it by revealing it with new red color at upcoming Geneva Motor Show. Is that vain move from Jaguar? No. 2018 Jaguar I-Pace is going to turn the SUV world upside down upon debut at the end of this year and here is why. You have an abundance of hybrid SUVs right now, and you have a decent offer of hatchback EVs, either awkwardly shaped or based on existing models and a couple of other things. But as for purely electric SUVs, you have Kia Soul and Tesla Model X. Kia Soul is hardly a prestige car or luxury crossover, not arguing with its trendiness, while Model X is hugely expensive with $90k price tag for a start and besides that, well, ugly. Competition is low, and Jaguar is about to enter the game with the best offer very soon. I-Pace openly resembles the F-Pace, it is based on it for a start, but it has enough of its own quirks. We see same imposing grille, but front fascia is more complex with huge muscular fenders and sharper lights. At the rear, we have similar rear lights but more protruding tail and sloppier roof. The whole silhouette is lower, and the cabin is somehow unusually positioned toward the front in honor to the CX75 concept. I-Pace is a just little bit smaller than F-Pace, but the cabin is huge due to unusual positioning, with even 4.5 inches longer wheelbase. It even beats BMW 7 Series in knee room at the back and it has three storage spaces, classic rear boot with 19 cubic feet of space, front cargo with 1 cu ft and even storage under center console which receives 0.3 cu ft of stuff. 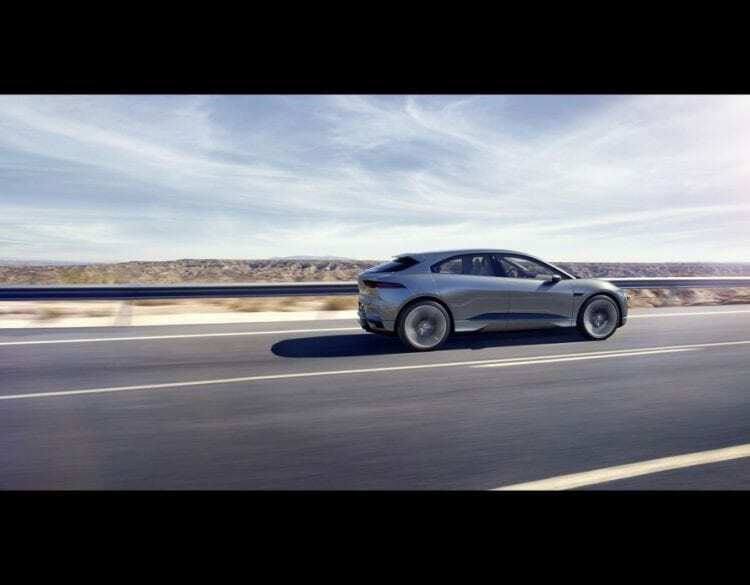 The cabin is fully digitalised with three screens, but in its case elegantly designed and complex, unlike Tesla’s scarce and overly simple one, and most of all it will be well built in Jaguar’s manner, which is the main problem with Model X. It has two compact electric motors, 90 kWh lithium-ion battery which sits at the center and very low, while total power is 400 hp and you have 516 lb-ft of instant and always available torque. It will reach 60 mph in 4 seconds and range will be around 300 miles. Battery needs only an hour and a half to charge to 80 percent while in two hours it is completely charged. Now comes the problem. F-Pace is definitely one of the driver’s SUVs, maybe even “the” best one, while I-Pace weight stroll around 4,600 pounds, or around 700 pounds more than its sibling, and that starts to worry us hugely. Jaguar nonetheless, promise the same F-Pace cornering magic and let us believe them, as I-Pace has an incredibly low drag coefficient of 0.29, it carries same aluminum chassis, double-wishbone front suspension, and Integral Link rear suspension and finally, the center of gravity is 4.7 inch lower due to the positioning of the batteries. More than anything! Maybe not powerful and that quick in the straight line as Model X, but just slightly slower, immensely more beautiful, incredibly better build and refined, with better range, actually fun to corner with and exceptionally cheaper with a price tag of around $67,000. Jaguar was maybe late to the SUV market compared to Swedish, German and Japanese rivals, but 2018 Jaguar I-Pace will bring this company on top of the game, no doubt.